DC/DC converters from PowerGood have 1.5 million hours mean time between failure (MTBF) and are available from Ideal Power. 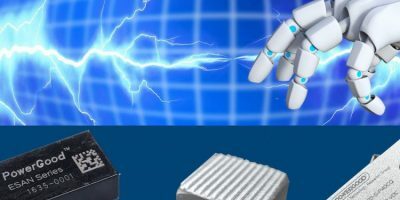 The ESBN, ESCN and ESAN series power supplies are suitable for robotics and other instrumentation applications, as well as transportation and railway applications. The converters are encased to protect against harsh environments. They all meet the EN61000 safety standard. To improve reliability, the converters have few components, with no life constraining capacitors. The products are available with the option of an embedded heat sink which allows them to work under the extended operating temperature range of -40 to +115 degrees C (for the ESBN series) or -45 to +115 degrees C (for the ESCN series). The ESAN offers an operating temperature range of -40 to +70 degrees C.
The isolated, board-mountable fixed switching frequency DC/DC converters use synchronous rectification to achieve high power conversion efficiency of up to 89 per cent (ESAN and ESBN) or 90 per cent at 5V/8A full load (ESCN). The converters also provide input-to-output isolation of up to 6000V DC (ESAN), 1600V DC (ESBN) or 2000V DC (ESCN), with a 2:1/4:1 wide input range. Output power is up to 15W (ESAN), 30W (ESBN) or 60W (ESCN). The converters are provided in a compact package with an industry-standard pinout. The ESBN measures 1.0 x 1.0 x 0.4 or 0.5-inch (25 x 25 x 10 or 12mm). The ESCN measures 2.0 x 1.0 x 0.4-inch (51 x 25 x 10mm). The ESAN is provided in a DIP24 package, measuring 1.27 x 0.65 x 0.4-inch (32 x 17 x 10mm). Ideal Power supports engineers with expert knowledge in specifying, sourcing and supplying power supplies, from typical external power supplies and battery chargers to internal power supplies and DC/DC converters. The company also offers bespoke power supply solutions, and has a dedicated technical support team.